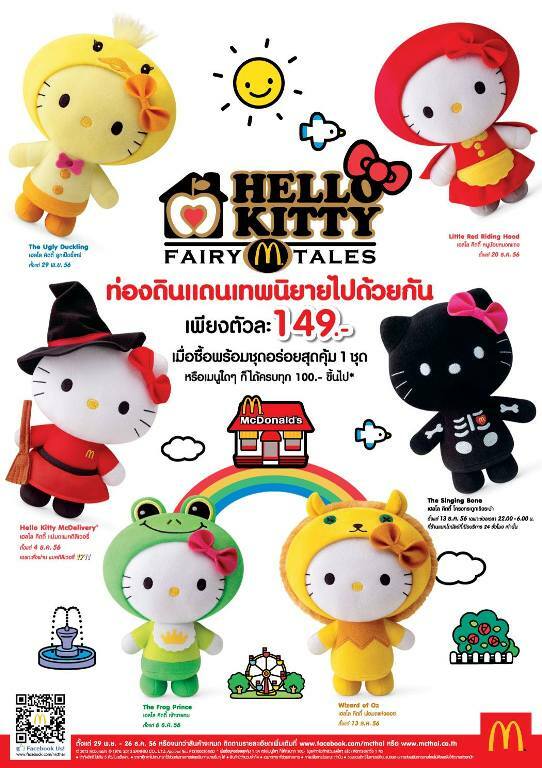 Every year ,the ever-popular Hello Kitty is back at McDonald’s, 2005 as four cute stationery collectibles resembling pretty make-up items. 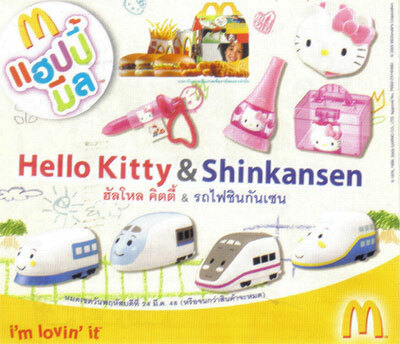 And she’s accompanied by four Sanrio Shinkansen characters, modelled after Japan’s bullet train. 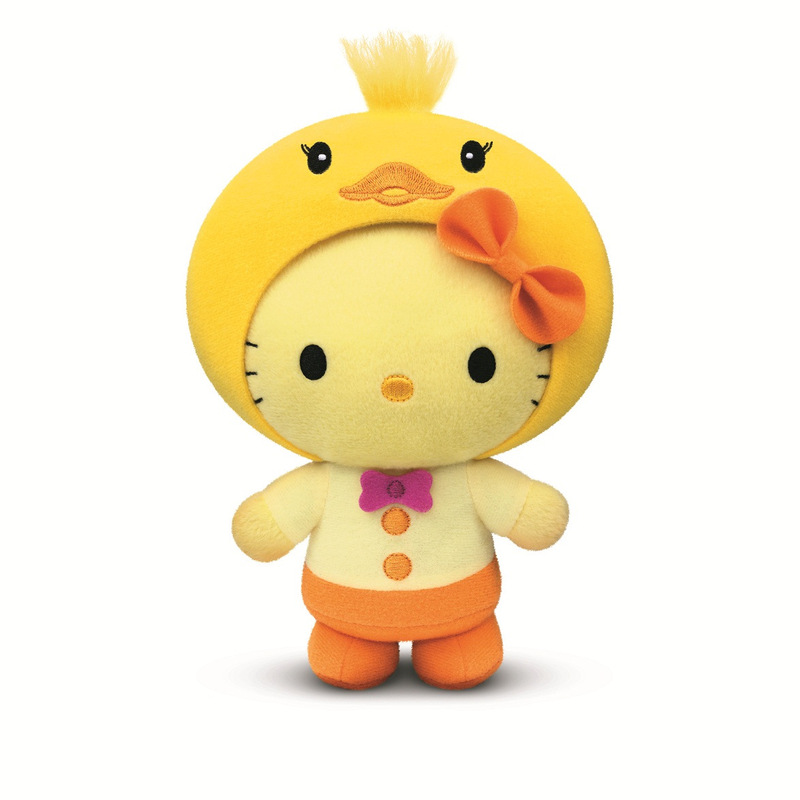 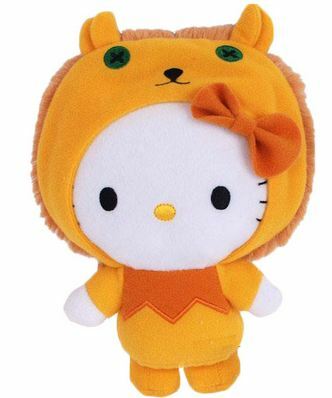 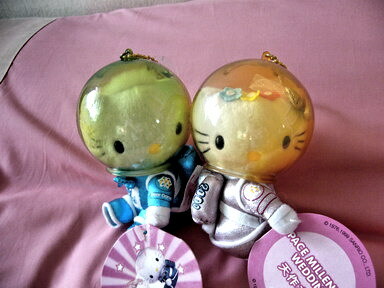 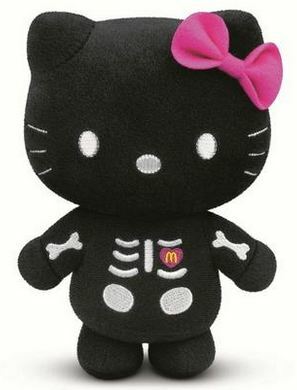 Starting March 24, McDonald’s offered a Hello Kitty or Shinkansen collectible with every McDonald’s Happy Meal purchase. 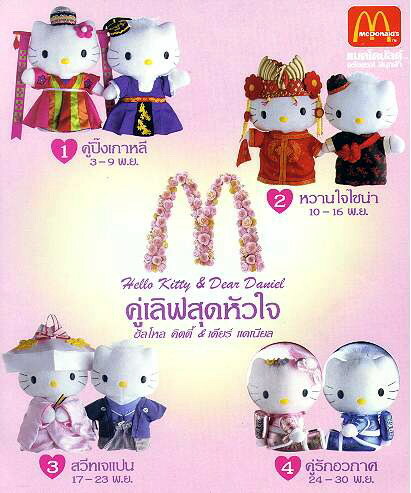 There are eight items to collect – the Hello Kitty Nail Polish Stamper, Lipstick Pen, Compact Memo Kit and Make Up Case as well as four different Shinkansen trains – Hikar, Komachi, Nozomi and Max Yamabiko. 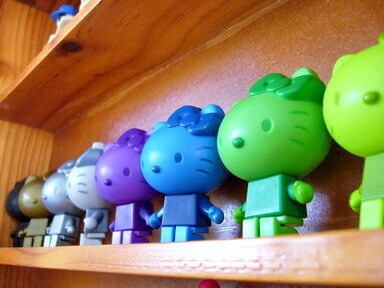 Make Hello Kitty stamp imprints with the Nail Polish Stamper, which looks like a nail polish bottle. 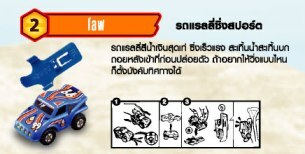 Turn the top of the Stamper to switch between red and blue stamps. 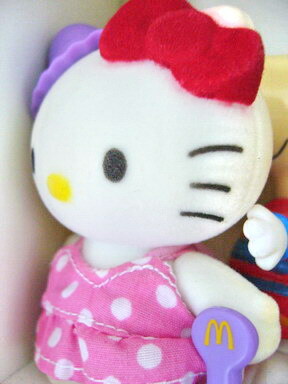 The Hello Kitty Lipstick Pen looks like a tiny lipstick on a key ring. 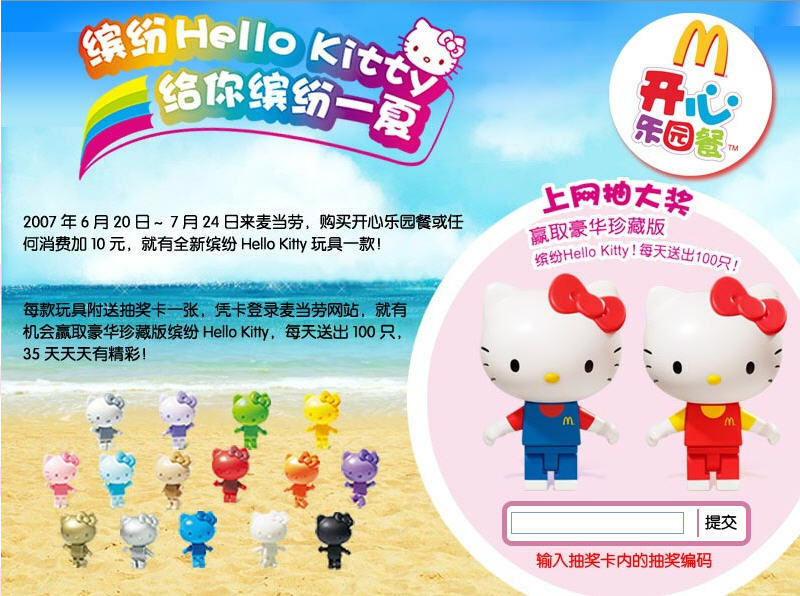 Twist the “lipstick” and it turns into a pen and dispenses Hello Kitty stickers. 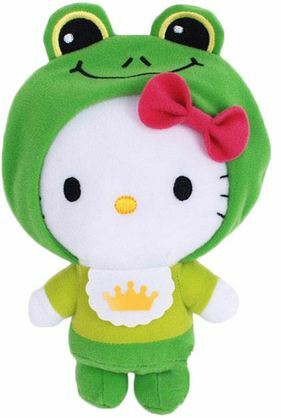 Shaped like Hello Kitty’s face, the Hello Kitty Compact Memo Kit combines the functions of a compact mirror and a memo kit. 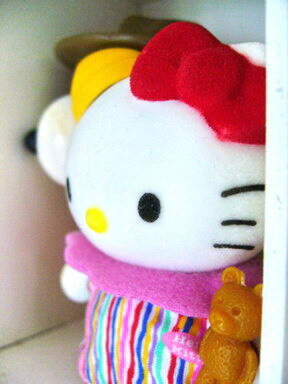 Open it to find a vanity mirror, note pads and a crayon for making tiny notes. 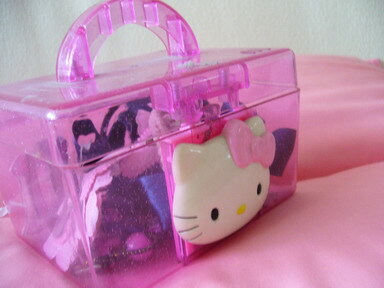 Pretty in pink, translucent shimmering plastic, the Hello Kitty Make Up Case is adorned with a Hello Kitty clasp and can double as a handbag and container for the other collectibles. 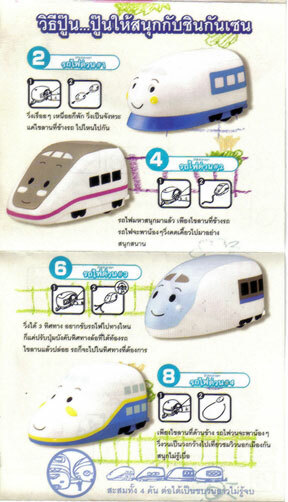 The adorable Shinkansen trains come in four designs and functions. 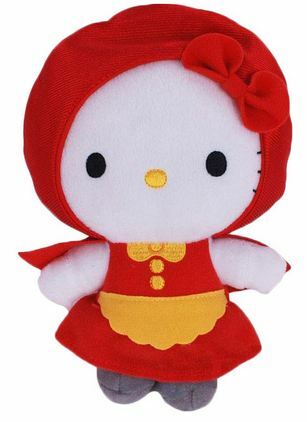 When wound up, Hikar stops in-between movement to mimic train stops, and Komachi speeds off like a bullet. 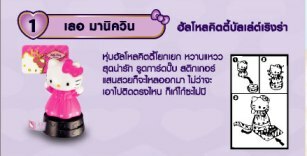 Nozomi randomly moves left or right, while Max Yamabiko travels in circles. 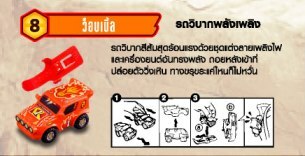 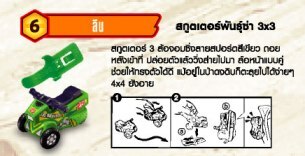 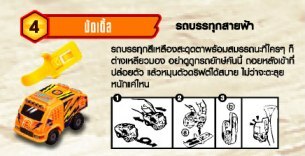 Collect all four to form a mega train set, which can move in different ways, depending on which train is placed in front. 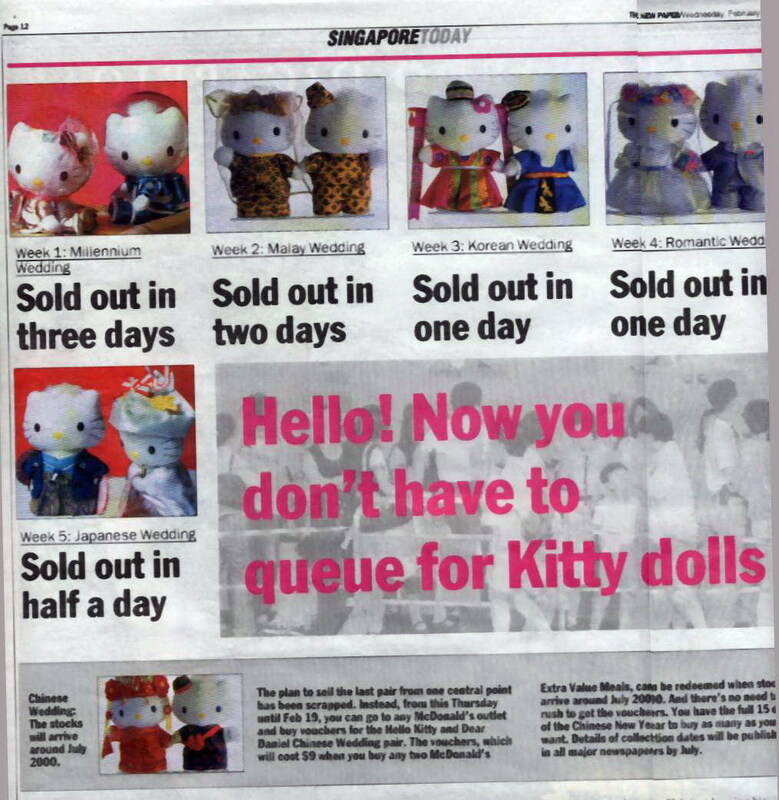 Hello Kitty Fan , rejoice! 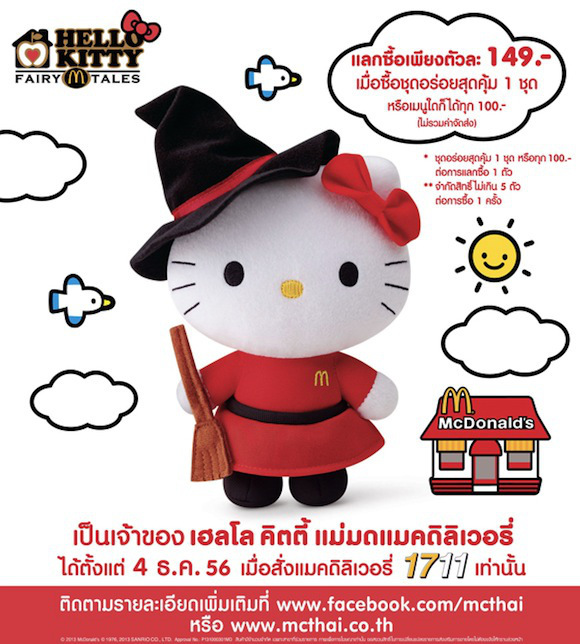 Hello Kitty will also be making an appearance in the rest of Mcdonald’s restaurants in Thailand this month. 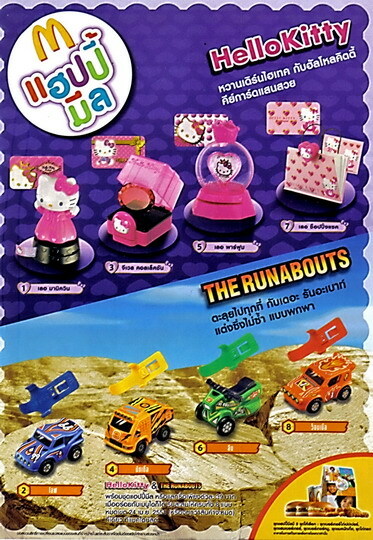 Starting this Sept 21st and running to Oct 18th ,a pretty cool promotion of Hello Kitty toys and Racing Turbo Car .Available 4 kitty toys and 4 racing cars. 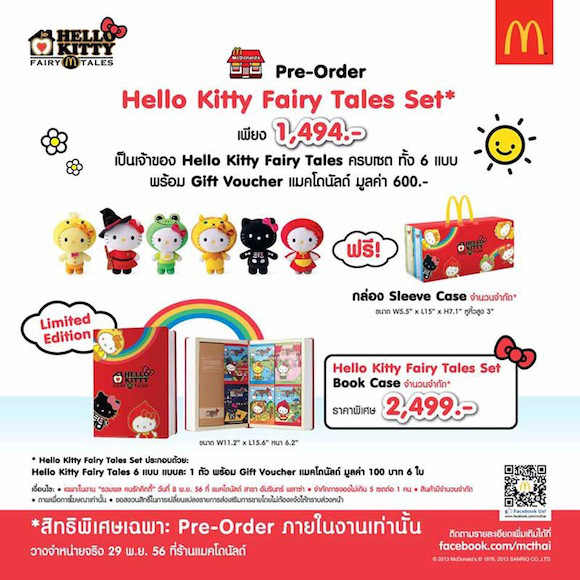 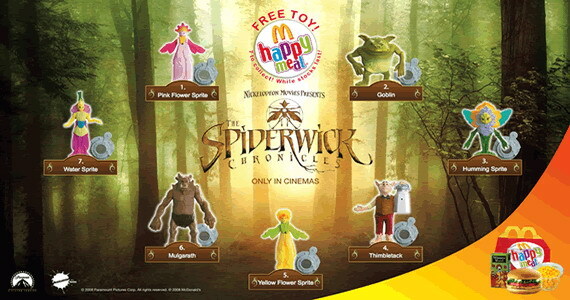 This promotion is also available in Malaysia and Japan this time. 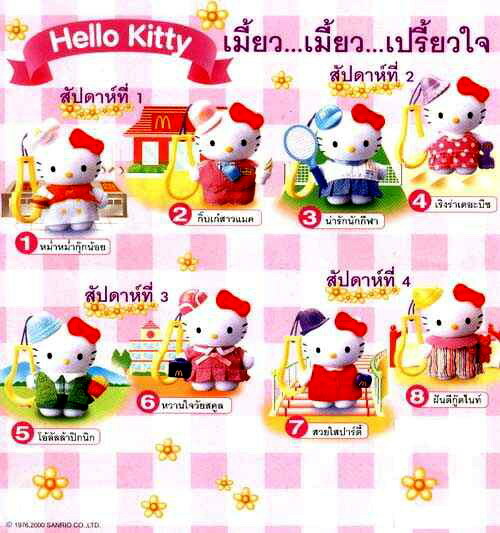 Hello Kitty Hello kitty Image projector, Hello Kitty Magic Viewer, Hello Kitty image Changer and Hello Kitty crayon tracer. 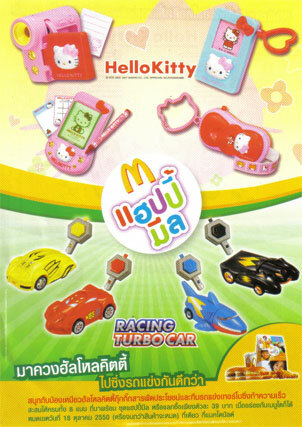 Racing Turbo cars Tiger,Shark,Panther,Eagle .They have their own keys to push the car in race.